Beautifully simple, the Alana Medical ID Bracelet is at once casual enough for everyday wear and special enough for those moments when you want to shine. 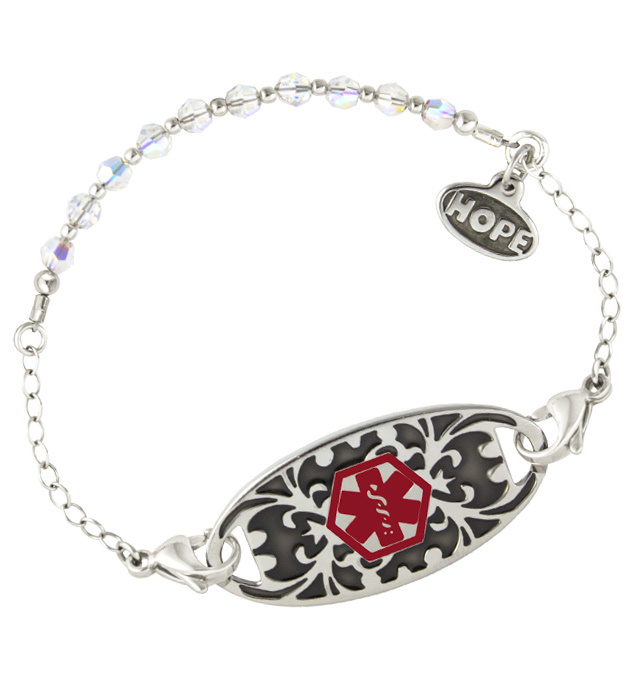 This striking, hand-crafted med alert features a beaded center with light-catching crystals and silver accents, topped off with our signature Hope charm. At either end of the beaded section, Alana is finished out with beautiful silver chain for an on-trend, yet classic look. Pair it with your favorite custom-engraved Lauren’s Hope medical ID tag for classic look that’s crafted to last. As with all of our interchangeable designs, your Alana Medical ID Bracelet pairs with any custom-engraved Lauren’s Hope medical ID tag, keeping what’s truly most important to you right at hand. This stylish med ID is a great choice whether you or your loved ones wear medical alert bracelets for a history of adrenal insufficiency or Addison's Disease, lymphedema or post-mastectomy care, heart conditions, food allergies, or any other medical condition or treatment consideration. Custom engraving allows you to choose the look you want so you can stay safe in style.